I have been asked to comment on Thanksgiving, the national holiday commemorating the first successful harvest season of the grim Protestant pilgrims of New England. Such Catholics, gathered around their laden Thanksgiving tables enjoying the company of family and friends, should know a quite consoling fact of American History: the first Thanksgivings on U.S. soil were Catholic. The American History books we studied as youth pretend that Colonial American History is exclusively what happened in the thirteen New England colonies. This ignores an enormous part of reality - our Catholic History. Little attention is paid to the epic northward advance by Spanish pioneers into the southern tier of States reaching from Florida across Texas and New Mexico to California, today called the Spanish Borderlands. The first two Thanksgivings in the present day United States were actually Catholic. The Pilgrims can only claim a third one, a correction I suggest should be made in school history books. The first Thanksgivings were celebrated by Spanish explorers, not pilgrims. It is Florida that today proudly claims the first Thanksgiving, with a feast and celebration between the Spanish and Timucuan Indians on September 8, 1565, 56 years before the Mayflower landed at Plymouth in 1621. Therefore, St. Augustine - and not Jamestown - is the first permanent European settlement and oldest city in North America. Another correction for many history books. The second Thanksgiving, the subject of this article, was in Texas. On January 26, 1598, a Spanish expedition set out from Mexico with the aim of founding a new kingdom. Three months later, after a long, dangerous trek forging a new trail northward, the now famous El Camino Real [The Royal Road], it crossed the Rio Grande and set up camp south of present day El Paso, Texas. On April 30, a Mass of thanksgiving was said, and the valiant leader of the expedition. Don Juan de Oñate, took formal possession of the new land, called New Mexico, in the name of the Heavenly Lord, God Almighty, and the earthly lord King Philip II. If the New Spain colonies had not set aside their Catholic heritage, perhaps today Florida would be celebrating its Thanksgiving day on September 8, while Texas would have its own special feast on April 30. This would be more in keeping with the healthy spirit of regionalism which characterizes organic society. Who was Don Juan de Oñate? 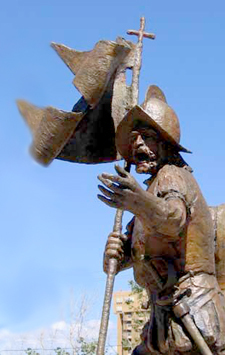 Don Juan de Oñate, the Basque leader of the New Mexico expedition, should become a name as familiar as Plymouth founder Captain John Smith or Puritan Governor William Bradford. His exploits, deeds, and spirit are of the sort that inspired the medieval sagas, or today, the epic film. 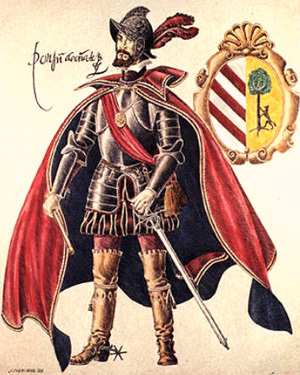 Juan de Oñate was from a noble Basque Spanish family that had become wealthy in the New World in silver mining. As a young man, Don Juan had led campaigns at his own expense in service to the Crown to pacify Indians near the northern outposts of Mexico. In his late 30s, he married Isabel de Tolosa, the granddaughter of the conquistador Fernando Cortes and Isabel Montezuma, the offspring of the late Aztec emperor. In 1595 Oñate was chosen by King Philip II to colonize and explore the provinces of the proposed kingdom of New Mexico. The terms of the arrangement sound quite unusual to modern ears. Don Oñate agreed to equip and arm at his personal expense 200 men to serve as soldiers as well as provide for their families and servants, to a total of 500-600 persons. He had to purchase sufficient food, clothing and supplies for the trek north as well as during the period of building the first houses. He also pledged to bring mining and blacksmithing tools, medicine, Indian trade goods, seeds, plows, and all the other necessities. In short, he completely subsidized the expenses of a dangerous, uncertain expedition that could easily end in failure. Why did he bother to undertake such a venture? He already had a position of prestige and power in New Spain; he was wealthy, with the potential to become even richer in silver mining had he remained where he was. Instead, he contracted to take on the momentous expenses of equipping and maintaining an expedition of some 600 people and set out on an uncertain, dangerous, and difficult march into an unknown, hostile terrain. Why did he go? He went for the adventure, to undertake a grand enterprise first, for the glory of God and King, and second, for his personal prestige. First, from his detailed record book, it is clear that Don Oñate went for God; his notes show a true desire to expand the boundaries of the religion of Our Lord Jesus Christ. He marched under a personal standard of white silk stamped on one side with pictures of Our Lady and St. John the Baptist, Oñate’s patron saint; on the reverse side was St. James on horseback carrying a sword. Only one expense of the expedition did the Crown assume: The King provided the Patronato Real, the Royal Patronage, agreeing to pay the expenses of the 10 priests and friars, who accompanied the group both to minister to the men and convert natives. It is a clear demonstration of the great importance the Crown gave to the missionary effort. Second, Oñate went for his prestige. In return for bearing the expenses of the expedition, he was promised the title of Governor, as well as the supreme military rank of Captain-General with civil and criminal jurisdiction over the Kingdom of New Mexico. These titles were granted for life with privilege of passing them on to his heirs. The Crown also agreed to award all Oñate’s men by making them nobles, hidalgos, after five years residence in New Mexico. So, Don Oñate and his expedition went forth in January of 1598, under the symbol of Cross and the authority of the Crown. It has been said that the Middle Ages drew its last breath in these captains and conquistadors of the New World. I think that it is very true. 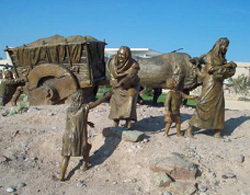 Certainly, the aims, spirit, attitudes and religion of the Spanish explorers could not have been more different from those of the Puritans who, motivated by self-interest, landed at Plymouth Rock to make a small, comfortable life for themselves and their families, with no thought of the spiritual welfare of the Indians, no dreams of heroism, glory or fame. This clear difference in spirit and mentality makes the colonial Catholic Spaniards a better model for Americans than the Puritans. After three long years of extremely costly delays, Don Oñate, age 43, set out from Santa Barbara, the most northern Spanish outpost in Mexico, on January 26, 1598. 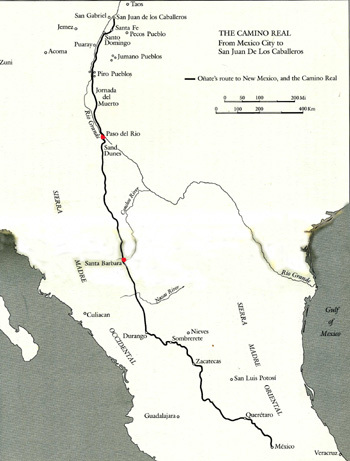 He aimed to establish a short, direct route due northward through 200 miles of Chihuahuan desert, a trail would later become part of the famous El Camino Real. The sprawling train he led was reported to spread out for three miles in length. It was a formidable sight: some 500-600 men, 175 of them soldiers, many of them in armor, 83 ox-carts, 26 wagons and carriages, and over 7,000 head of livestock. In January 1598 the expedition left the last Spanish outpost of Santa Barbara & headed north to the Rio Grande. Then he ordered up his horse and without pause plunged into the foaming torrent and reached shore. His exploit set the example, and the crossing was made. Only the sheep were left behind on the south bank, unable to swim because the weight of their wool when soaked with water would pull them under. Don Juan ordered the wooden wheels removed from the carts, anchored them in pairs to rafts, and strung them in a line over the water. The bleating sheep crossed the Conchos on them, and the expedition continued. By early March, Oñate’s expedition had reached the treacherous Chihuahuan Desert. Some days into the desert journey, they were desperately in need of water. Unexpectedly they came to a small stream, which they named the Rio Sacramento because it was found on Holy Thursday, the feast of the institution of the Blessed Sacrament. The next day, Don Oñate ordered a halt and a temporary chapel was erected for Easter Mass. They named the site Encinar de la Resurrección, Place of the Resurrection. The men passed the night in penance and prayer; Don Oñate also bared his back to take the discipline in atonement of sins, a common practice among the Spanish faithful during Holy Week. This was how the journey progressed. At every crucial moment, an aid from Heaven came. For the soldiers and colonists, those aids were miracles from God who was blessing their venture. To pay Him some small thanks, they gave the streams that they found, the sites where they rested, holy names that glorified God and His Saints. Finally, on April 21, 1598, the exhausted expedition reached the banks of the Rio Grande. For the last five days of the march, the expedition had run out of both food and water, and the colonists had suffered a mind-numbing thirst. Don Oñate, seeing the extreme fatigue on the faces of the people, proclaimed a week’s rest on the river bank as scouts searched for a suitable place to ford the river and cross into New Mexico, what is the present-day El Paso, Texas. Oñate ordered a temporary church to be constructed with a nave large enough to hold the entire camp. Under those boughs, on April 30, 1598, the feast day of the Ascension of Our Lord, the Te Deum was sung and the Franciscans celebrated a solemn high Mass, the first Thanksgiving celebration in our lands. To the fanfare of trumpets and volleys of musket shots, Oñate signed and sealed the official act with a flourish, and the Holy Cross and the royal standard were both raised in the camp, completing the legal requirements of La Toma. With that, the kingdom of New Mexico came into being, at midday on April 30, 1598. The colonists went on to celebrate the first Thanksgiving with a grand feast of fish, “many cranes, ducks and geese.” The rest of the day passed with song, foot races, and other competitive games. 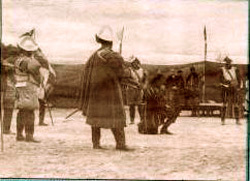 In the evening, all enjoyed a play, written by one of Oñate’s captains, Marcos Farfan, which enacted happy scenes of the Franciscan missionaries entering the country, the Indians kneeling to receive them and asking to be received into the Holy Faith. This is the description of that glorious festivity which represents, I am convinced, the plan of God for those lands that today comprise our country. 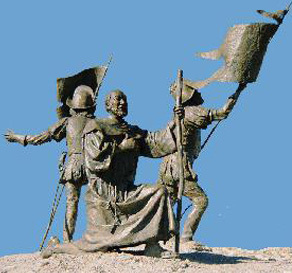 Since the last Thursday of November is a random date to commemorate Thanksgiving, I propose that Catholics in Texas commemorate on this day the conquest of Don Oñate and the Franciscan priests, rather than that bitter harvest of the Puritans. I am sure that this will glorify Our Lord Jesus Christ and gain his blessing for our future. 2. Mattox, Jake, ed., Explorers of the New World, Farmington Hills, MI: Greenhaven Press, 2004. 3. 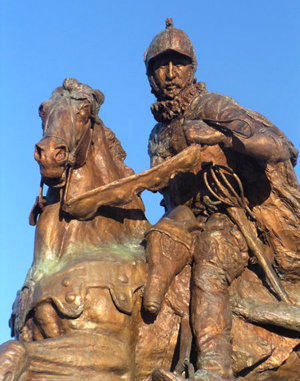 Simmons, Marc, The Last Conquistador: Juan de Oñate and the Settling of the Far Southwest. Norman: University of Oklahoma Press, 1991.